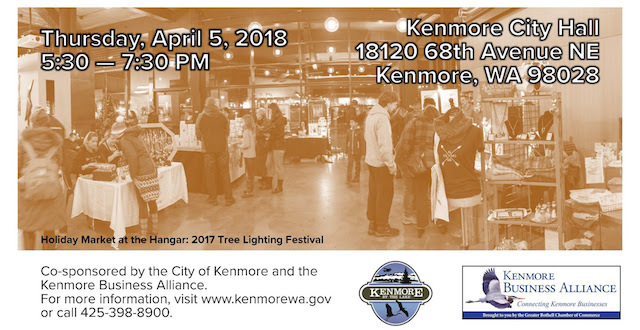 Meet up with local businesses at the semi-annual Kenmore Business Networking Open House on Thursday, April 5, from 5:30pm - 7:30pm at Kenmore City Hall, 18120 68th Ave NE. This event is sponsored by the City of Kenmore and the Kenmore Business Alliance. Network with local business people and hear the latest on what's happening in your city. We encourage you to bring marketing materials for your organization. No RSVP necessary. Light refreshments will be provided. For more information, contact Nancy Ousley, Assistant City Manager, at nousley@kenmorewa.gov, or 425-398-8900.